Just one of the three giant racks we have to hold used parts! Folks, now its a fact that there are a LOT of used parts here at Hit & Miss Enterprises! We have a few parts for some engines and a lot of parts for others. 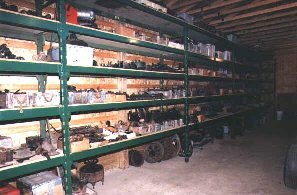 If you're looking for an original part, our used parts area is a great place to look. Our inventory is always changing, so its best to call us at 440-272-5335 or email us and see what we have. And, if we don't have it used, there's a good chance we have a new reproduction of your part as we stock a LOT of those too.